Taken from frozen Upper Cathedral Leak near Cathedral Peak in Yosemite National Park on May 2nd, 2014. After slogging through four miles of slushy snow I reached Upper Cathedral Lake just after sunset. Exhausted from the tiresome hike in I didn’t try to photograph the lingering colors of sunset, but rather set up my camp in the waning light. As evening cooled down it sucked all the moisture out of the air and soon the skies were so clear and crisp they almost seemed solid. A handful of stars began to scintillate in the inky blue sky above Cathedral Peak and as the night deepened more and more pinpoints of light added their sparkle to the sky. By about 9:30 pm thousands of brilliant flecks of light encrusted the sky. A crescent moon just above Mt. 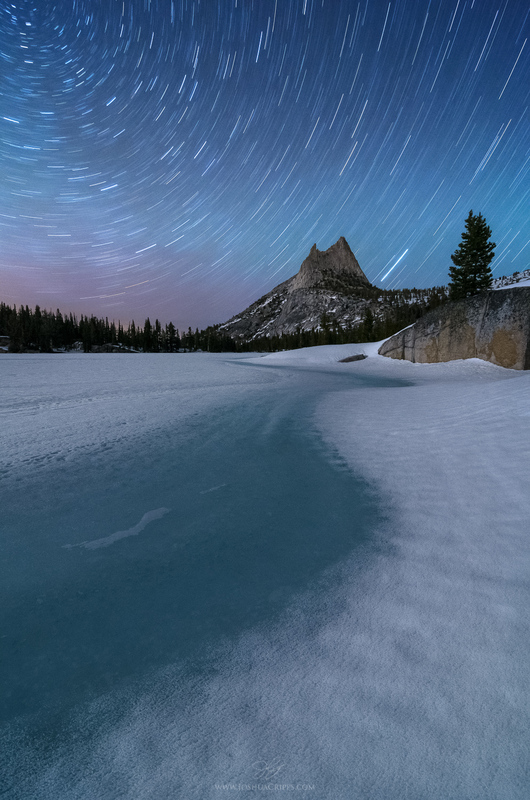 Tressider was adding a faint glow to the ice and snow on Upper Cathedral Lake and I used a long exposure to bring out the sparkles, both in the sky and on the ground.